BEVERLY HILLS, Calif. (AP) - Just how bad is the economy these days? So bad that even the kingdom of Beverly Hills has had to lay off its ambassador. Gregg Donovan, the jovial, stentorian-voiced actor who has spent much of the past dozen years in top hat and tails giving directions, posing for photos, promoting local businesses and bellowing in dozens of languages, "Welcome to Beverly Hills! You have arrived," is leaving. Donovan says he got the word last month from his bosses at the Beverly Hills Conference & Visitors Bureau that they could no longer afford him. As word of his fate has begun to spread up and down a street covered if not in gold at least Gucci, people are not happy. "How could they do that?" asked CNN's Larry King who bumped into Donovan during a recent morning stroll. "He's a Beverly Hills institution." Korosh Soltani, who runs David Orgell, the venerable Rodeo Drive jeweler that has provided bling to everyone from heads of state to people attending the Oscars, Golden Globes and Emmys, called Donovan "a face of the city." Indeed, Donovan's mug is plastered right on the visitors maps handed out all over town, as well as on T-shirts in some of the souvenir stores. That fact has made his departure a little less than amicable. Under terms of a separation agreement he showed The Associated Press, Donovan was asked to relinquish his red ambassador jacket, as well as the rights to any photos, videos or other materials representing him as the city's ambassador. Donovan, who has posted dozens of photos of himself with celebrities on his website, has refused to sign. Instead, he's asking anyone who ever had a picture taken with him to e-mail Mayor Jimmy Delshad and ask that he get his job back. He's also written to Delshad, asking for his help, but says he hasn't heard back. Delshad's office said the mayor was unavailable for comment but couldn't help because Donovan was employed by the visitors bureau and not the city. The visitors bureau's executive director, Kathy Smits, did not respond to phone and e-mail messages. Since he was let go, Donovan said he has kept busy taking in movies, going to the gym and looking for work. 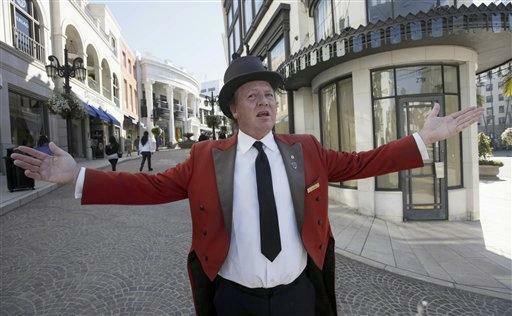 The 51-year-old former concierge and personal valet to Bob Hope said he'd be willing to take a similar job, perhaps in a place like Hollywood. "But this was special," he added softly. Meanwhile, he put on his top hat, jacket, frilly white shirt and black tie for what could be the last time one day last week and returned to Rodeo Drive to say goodbye. Between handshakes and heartfelt farewells, he couldn't resist bellowing out a hearty, "Welcome to Beverly Hills" every time a tour bus rolled by. Or offering directions and posing for pictures as crowds disgorged by the buses quickly surrounded him. "We need you here, all of the tourists have been asking for you," said Mohamad Abbouchi, who runs the pricey Rene Mancini women's shoe store where the most well-heeled clients try on pumps by appointment only. Others looking for shoes or handbags, but shy about approaching the store, would be walked right in the door by Donovan and introduced, Abbouchi said. That's a particular perk that Beverly Hills will be missing, he and others said. "It's a hell of a thing," muttered King as he bid Donovan goodbye. "Anything I can do," the veteran CNN broadcaster added as he headed down the street, "let me know."